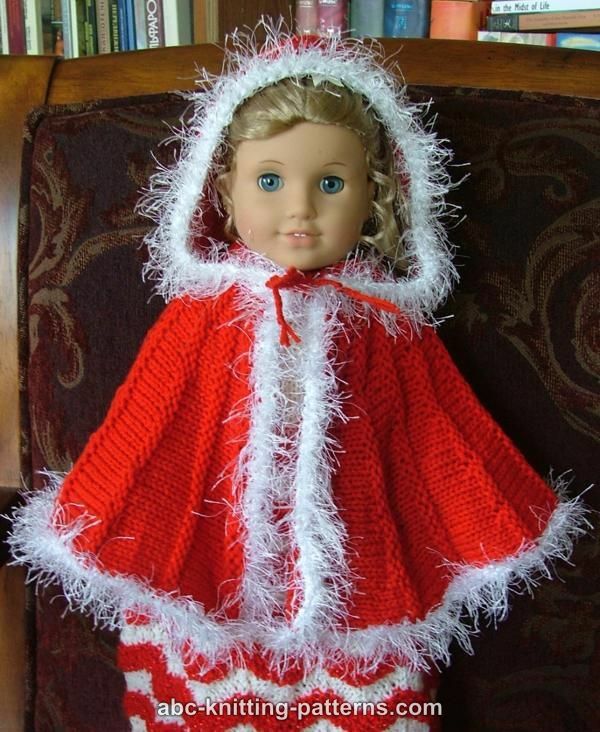 This knitted cape is simply essential for the American Girl Doll intending to go caroling this Christmas Eve! I was inspired by the style of cape often worn in Victorian times. The cape is knitted sideways and shaped with short rows. 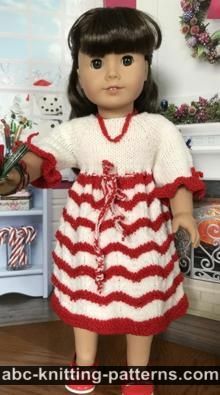 If you are just learning to use short rows, this small, simple pattern is a great opportunity to practice the technique. 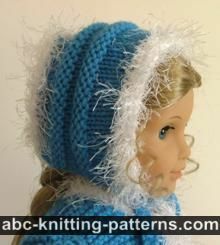 Below, I link to a video that explains how to make short rows. I made the fur trim using crochet. This is my preference. 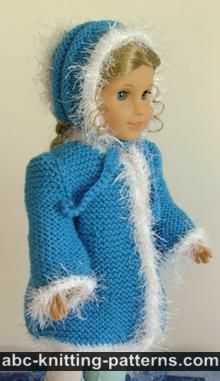 However, the Finishing section also describes how to do the finish with knitting. The fun fur trim is optional depending on the look you're going for. If you prefer the cape not to have the trim, finish the cape in exactly the same way, but use the main yarn instead of the fun fur yarn. 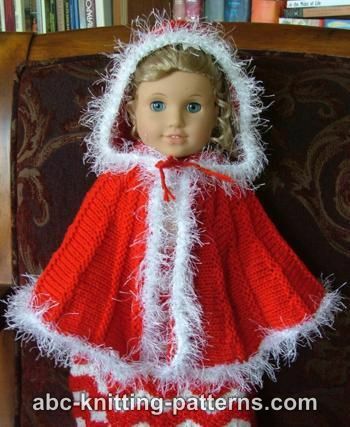 This would be perfect if you were making your doll a Little Red Riding Hood outfit. The 1st and last stitches of the pattern are selvedge stitches. Selvedge stitches are used to make the edges of the work even and smooth 2. You should slip the first stitch as if to knit and purl the last stitch. 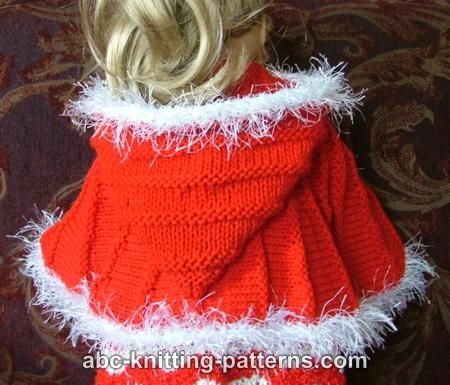 Cape is worked sideways with short rows as one piece. Repeat Rows 5-32 8 more times. Row 8: sl 1, k 69, turn. Repeat rows 3-10 3 more times. Fold the hood in half widthwise and sew the back seam. Sew the hood to the neckline of the cape. Pick up 3 sts on the right front of the neckline. Make an I-cord 3- 4" long. Pick up 3 sts on the left front of the neckline. Make an I-cord 3- 4" long. With the yarn B crochet 3 rows of single crochet (sc) along all edges of the cape and the hood. If you don't crochet, you can achieve a similar look by picking up the sts along the edges of the garment and knitting 4 rows of garter st. There are 23 total comments on this article. SC is "single crochet". 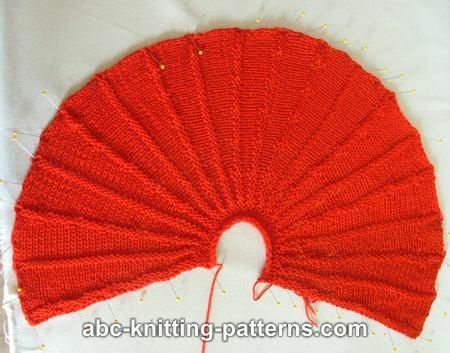 There are good youtube videos showing how to sc around a knitting project, that will help you. You will not be knitting across the whole row. Only the number of stitches indicated. For row 5. Slip the first stitch. Knit 5 stitches. Do your wrap and turn. The wrong side of your work should be facing you. You should have 6 stitches on your left needle and 29 on your right needle. Turn your work so the right side is facing you. Row 7 - slip the first stitch, knit the next 10 stitches. Do your wrap and turn. Wrong side should be facing you with 11 stitches on your left needle and 24 stitches on your right needle. Row 8 - purl the stitches on your left needle. These are called short rows. When knitted this way, it creates a wedge. If you are able, take a look at the video for how to do the wrap/turn. I agree about the confusion. I have taken it back twice, and today I took it back to the beginning to see if I can make sense out of it. I now trying to do the repeat starting from AFTER the 6th row so that there are only 2 raised rows between the short rows. I am thinking that will make it look more like the picture. An I-cord is where you knit a tube with 2 double pointed needles. Cast on like normal and then knit the first row. Now instead of transfering the work to the other hand you move the work to the other side of the needle. So you will knit the next row with the yarn coming from the left hand side instead of the right. Doing this will make a small tube that can be used as drawstrings. My cape came out nice but hood does not look like picture. Must be an error in instructions for hood. Has anyone tried this in a larger size needle than the size 4 . Thank you, I can't believe how easy this is. I just got back into knitting and was worried about the turning but it wasn't so bad. Thank you again.